Presentations, celebrations, conferences, lectures and other upcoming and past events. International Reader's Conference with Vladimir Megre, Author of the Ringing Cedars of Russia Series. The Anastasia Foundation for Culture and Creative Support of the City of Vladimir along with “Ringing Cedars Ltd.” announces that, from 10th of October to 17th of October 2008, it will hold an international readers’ conference with the participation of Vladimir Nikolaevich Megré, author of the “Ringing Cedars of Russia” books. It is planned to hold the conference, which will be seven days in duration, in a five-star hotel in Turkey. Day 1: 10 October 2008. Arrival, assigning accommodations, registration of arrivals, familiarization with the detailed schedule of events, familiarization with additional information and the grounds of the hotel. Viewing of a television programme on closed-circuit television entitled “Allow me to introduce myself,” which talks about the participants in the conference and about villages under construction and in operation. Day 2: 11 October 2008. Arrival, assigning accommodations, registration of arrivals, familiarization with the detailed schedule of events, collection of additional information, announcements, beginning of the operation of the internal mail service, operation of the close-circuit television system, programme “Allow me to introduce myself.” Get-acquainted party. Day 3: 12 October 2008. Meeting of Vladimir Nikolaevich Megré, the author of the “Ringing Cedars of Russia” books, with readers. From 10:00 a.m. to 1:00 p.m.—beginning of the international conference and answers to questions from readers. Day 4: 13 October 2008. Presentations by scientists, economists, on the idea of creation of Kin’s Domains. Exhibit and sale of folk art products. Demonstration of individual models of clothing. Exchange of experience in the construction of kin’s domains. Day 5: 14 October 2008. Exhibit and sale of folk art products. Demonstration of individual models of clothing. Exchange of experience in the construction of kin’s domains. Day 6: 15 October 2008. Exhibit and sale of folk art products. Demonstration of individual models of clothing. Exchange of experience in the construction of kin’s domains. Also: “The readers who came to the conferences had a noble goal, identical for women and men. Their advantage consists in the fact that the men and women created their own image of their life and future family in their dreams. When they came together, they had a topic of conversation interesting for both.” Rites of Love, Book 8, Part 2. Day 7: 16 October 2008. Free interaction day, farewell party. Amateur talent concert by the conference participants. Day 8: 17 October 2008. Free interaction day, farewell party. For those who wish to participate in the “Allow me to introduce myself” programme and talk about their eco-village and its residents to the participants of the conference and to clubs in various countries, we ask that, prior to 1st of September 2008, to fill out the form by the address: https://www.ringingcedarsofrussia.org/conference/allow-me-to-introduce-myself.php, or send us a short video on a DVD about your settlement, with a duration of no longer than 15 minutes (if a group presentation), to one of the addresses listed below. It is advisable to show a general view of the area and individual details of the landscape design and, of course, the people. Each member of the settlement may also be presented on in the film; the duration of each individual presentation should be no more than 3 or 4 minutes. Conference participants who do not live on a kin’s domain may also send their presentation. Recommendations: film using a tripod, pay special attention to the sound, choose a house or a festival as the background for an individual shot. If problems arise in hiring a qualified video operator, you can produce a photo report, but be sure to put it on a disk with accompanying text. The organizing committee of the conference will invite professional interpreters to Turkish, English, German and Russian for a synchronized translation of Vladimir Megre’s presentation. However, we cannot guarantee that we can provide interpreters for individual personal interactions, so we suggest that groups consisting of individual settlements should select an interpreter from among their participants. During the entire period, a mail service and information-inquiry service will be operating, through which you will be able to contact any conference participant of interest. In the event you wish to submit your hand-made articles for exhibit, you must inform us prior to 15 September 2008 by e-mail which is listed below. The schedule of events has been considered put together by us based on financial resources. If you have any suggestions or comments that are within our means, we are prepared to listen to and discuss them. 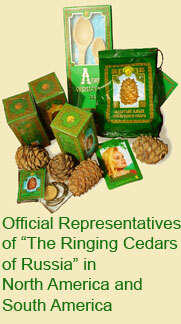 Please visit http://www.ringingcedarsofrussia.org/conference/index.php for more information.